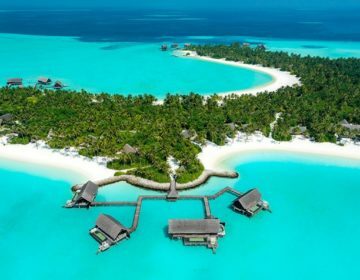 Located on the private island of Lankanfushi in Malé Atoll and surrounded by lush tropical gardens, Gili Lankanfushi Maldives is a luxurious island retreat in the Laccadive Sea. 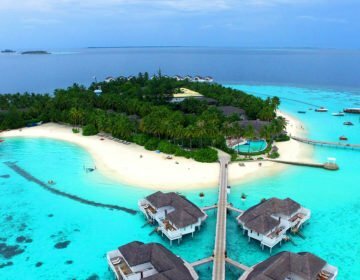 The stunning seaside resort features elegant, over-water villas constructed from natural materials and accessed by boardwalks from the island. Exquisitely appointed villas have wooden floors, open-air living rooms, and stylish rooftop terraces, and upgraded villas offer elegant dining areas, mini wine cellars, and private motor boats. Some villas include personal butler services, state-of-the-art cinemas, and private spa areas. 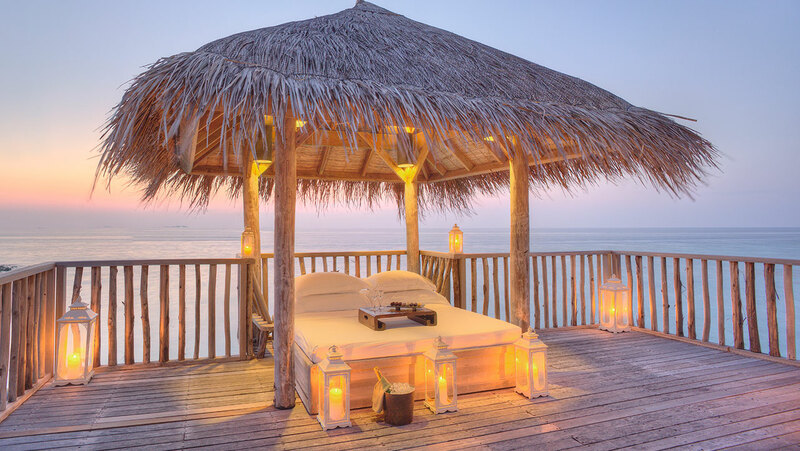 The resort features a variety of upscale, beachfront dining options including fresh seafood and handmade Japanese cuisine, an over-water bar and a chocolate and wine cellar. 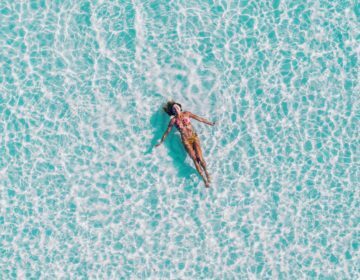 Upscale facilities range from a beautiful swimming pool with sun decks and loungers, a tranquil water garden, an exclusive spa and wellness center that offers traditional Ayurvedic treatments and yoga programs, and a modern cinema. Other recreational activities include snorkeling and scuba diving, island day trips and tours, and tennis. 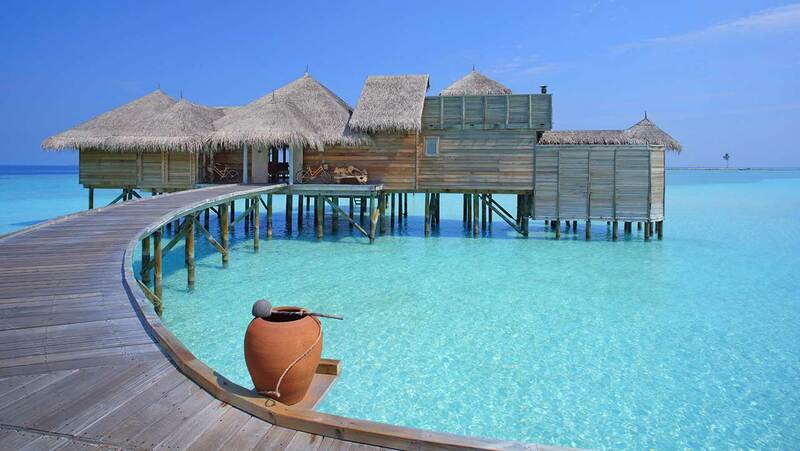 Gili Lankanfushi Maldives features elegant, over-water villas ranging in size and opulence with breathtaking ocean views. Exquisitely appointed villas have wooden floors, open-air living rooms, and stylish rooftop terraces, and upgraded villas offer elegant dining areas, mini wine cellars, and private motor boats. Some villas include personal butler services, state-of-the-art cinemas, and individual spa areas. Modern in-room amenities include HDTVs with extensive on-demand movie selections, Bose entertainment systems, air-conditioning and fans, fully stocked mini-bars and Nespresso machine, and a Mr. Friday service. Villa Suites are 210 square meters in size and feature open-air living rooms with daybeds, elegant dining areas, beautiful rooftop terraces with daybeds and dining tables, bedrooms with king-size beds dressed in luxury linens, and semi-open en-suite bathrooms with walled glass showers, plush towels, bathrobes and slippers, and designer toiletries. Over-water sundecks boast catamaran nets, sun loungers, daybeds and direct ocean access, and there are bamboo bicycles for every guest to explore the island. Modern in-room amenities include HDTVs with extensive on-demand movie selections, Bose entertainment systems, air-conditioning and fans, fully stocked mini-bars and Nespresso machine, and a Mr. Friday service. Five over-water luxurious west-facing Gili Lagoon Villas offer 210 square meters of luxurious space and spectacular sunset views. Spread across two floors, these thatched one-bedroom hideaways feature open-air living rooms, spacious en-suite bathrooms and private rooftop terraces with daybeds and dining tables. Over-water sundecks boast catamaran nets and over-water hammocks, sun loungers, daybeds and direct ocean access, and there are bamboo bicycles for every guest to explore the island. Modern in-room amenities include HDTVs with extensive on-demand movie selections, Bose entertainment systems, air-conditioning and fans, fully stocked mini-bars and Nespresso machine, and a Mr. Friday service. Perched at the end of the island’s western-facing jetty, the 350-square-meter Family Villa offers unrivaled panoramic views of the surrounding sapphire seascape and exquisite sunsets. The spacious master bedroom has a king-sized bed, and an en-suite bathroom with an outdoor tub and shower area and two sizeable air-conditioned living rooms provide ample living (and extra sleeping) spaces. The villa has a kitchenette with mini wine cellar, an in-villa steam room, and a rooftop terrace with daybeds, dining facilities, and Jacuzzi and spa beds for private massages. An over-water sundeck boasts catamaran nets and over-water hammocks, sun loungers, daybeds and direct ocean access, and there are bamboo bicycles for every guest to explore the island. Modern in-room amenities include HDTVs with extensive on-demand movie selections, Bose entertainment systems, air-conditioning and fans, fully stocked mini-bars and Nespresso machine, and a Mr. Friday service. 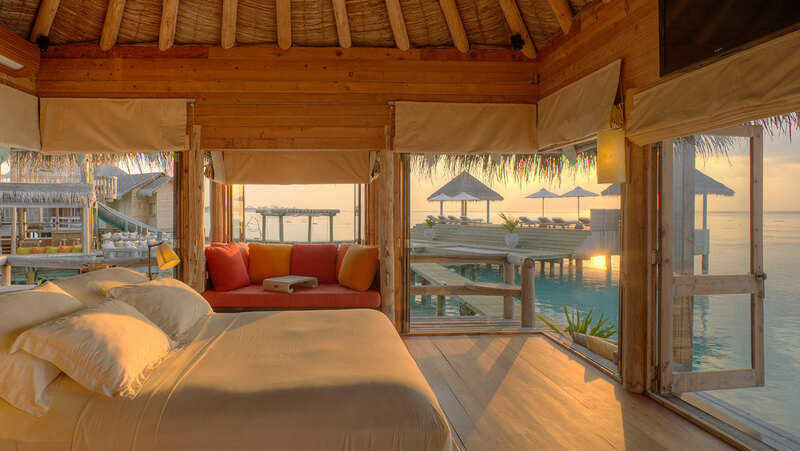 The Family Villa also has access to a nearby secluded three palm island with a hidden cabana for a relaxing afternoon. 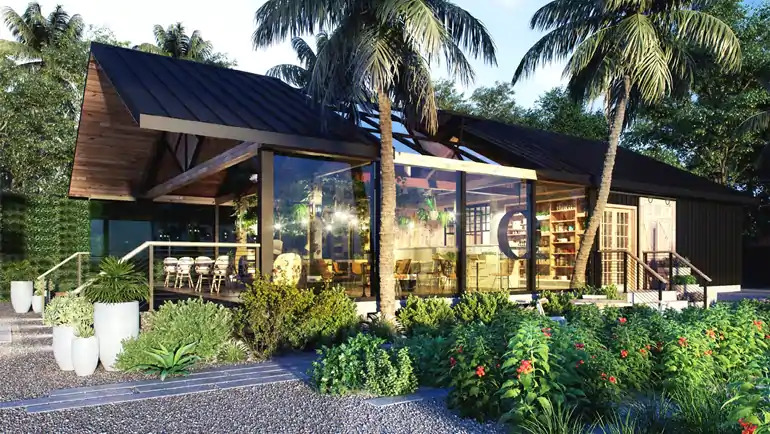 Located at the far end of a private jetty that extends out above the turquoise waters, the Gili Lagoon Residence boasts 250 square meters of space and features a spacious air-conditioned living room with two large daybeds, a dining table, and a private mini wine cellar. The master bedroom has a king-size bed dressed in luxury linens, and a semi-open en-suite bathroom with glass-walled shower, plush towels, bathrobes and slippers, and designer toiletries. The Gili Lagoon Residence has a glorious rooftop terrace with a daybed and dining table, and a floating sundeck with sun loungers. 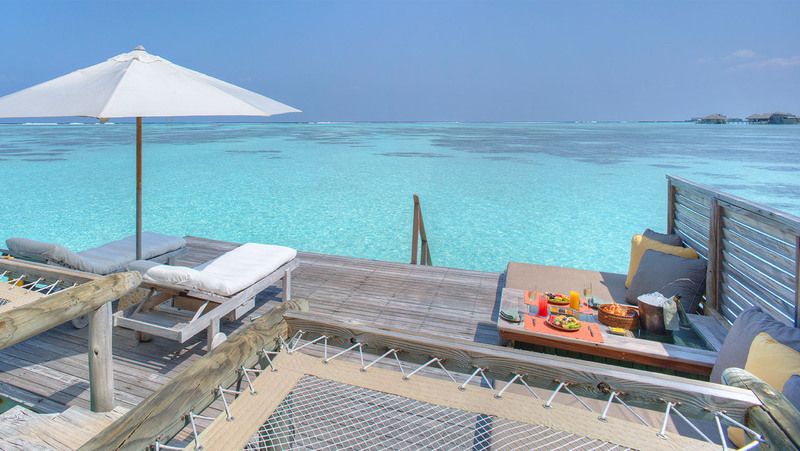 An ove- rwater sundeck boasts catamaran nets and over-water hammocks, sun loungers, daybeds and direct ocean access, and there are bamboo bicycles for every guest to explore the island. Modern in-room amenities include HDTVs with extensive on-demand movie selections, Bose entertainment systems, air-conditioning and fans, fully stocked mini-bars and Nespresso machine, and a Mr. Friday service. Seven magnificent Crusoe Residences stand alone in the Indian Ocean and are accessed by a private motorized boat or the resort pontoon. The 250-square-meter villas feature spacious air-conditioned living rooms with two large daybeds, dining tables, and private wine cellars. The master bedrooms have king-size beds dressed in luxury linens, and semi-open en-suite bathrooms with glass-walled showers, plush towels, bathrobes and slippers, and designer toiletries. The Crusoe Residences have incredible rooftop terraces with daybeds and dining tables and over-water sundecks with sun loungers and private hammocks. Modern in-room amenities include HDTVs with extensive on-demand movie selections, Bose entertainment systems, air-conditioning and fans, fully stocked mini-bars and Nespresso machine, and a Mr. Friday service. The Private Reserve offers unrivaled rustic über luxury in the form of a decadent private palace surrounded by a sapphire lagoon. The opulent Reserve is 1,700 square meters in size and boasts uninterrupted views of the Indian Ocean with two master en-suite bedrooms, a third guest room with en-suite bathroom, private indoor and outdoor relaxation areas and sun decks, and a large central open plan living area with a sea garden and a natural coral pool, an outdoor dining area, writing desks and chairs, and elegant daybeds. The villa features an infinity swimming pool on the upper sun deck with a water slide leading into a private lagoon swimming area, an air-conditioned gym on the second floor, a private cinema, and a private couple’s spa with a sauna, steam room, and indoor and outdoor treatment pavilions. A private wine cellar houses over 400 reserve labels, two rooftop terraces have two open-air dining pavilions, a fully equipped gourmet kitchen is perfect for entertaining, and personal butlers, chefs, and housekeeping staff are available. There are easy-to-use motorized transfer boats for exclusive guest use, along with a luxury yacht for arrivals and departures. Gili Lankanfushi Maldives presents a sumptuous array delectable Maldivian and international cuisine at several different restaurants around the resort, including freshly caught local seafood using traditional and sustainable Maldivian techniques, fresh salads and vegetables, and another delicious fare. Themed menus are offered on different nights of the week, along with mouthwatering a la carte menus. The Underground Wine Cellar provides unique chocolate, cheese and wine tastings in a subterranean wine cellar that makes for a spectacular dining venue. Set close to the shoreline, the open-air Kashiveli is the place to enjoy a bountiful breakfast or an enchanting candlelit dinner. 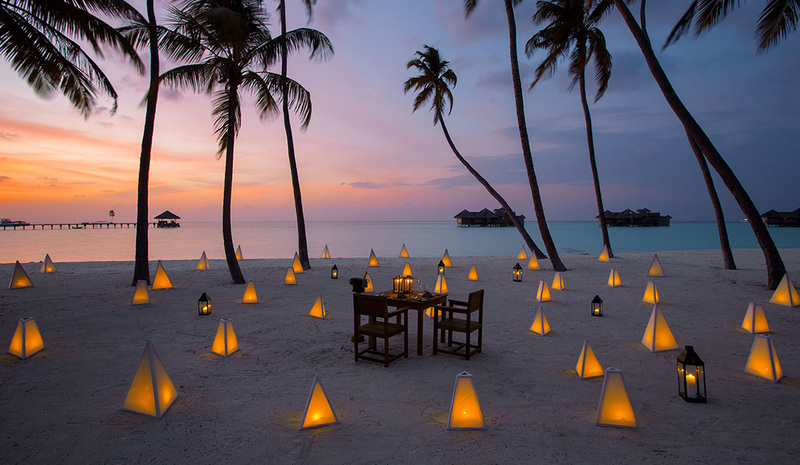 Tables spill onto the beach, offering alfresco dining under towering palms, against the backdrop of the gentle sounds of the sea. A sumptuous breakfast spread is served every morning, and certain nights offer multi-course gourmet menus for dinner. Twice weekly themed evenings see this restaurant come alive with an Exotic Asian Street Market on Tuesdays or Mediterranean Spice Souk on Fridays. Engulfed by lush tropical jungles and offering sweeping ocean views, By The Sea is an intimate restaurant that presents an unforgettable Japanese fine-dining feast of exquisite sushi, sashimi, and specialties from seasonal tasting menus. Guests can watch the highly skilled teppanyaki chef as he puts on a show of culinary acrobatics as dinner is prepared, and an extensive sake list is sure to impress. 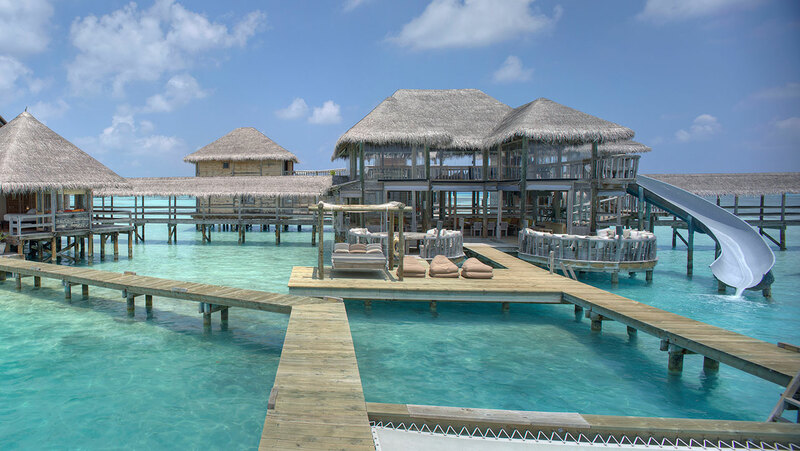 Standing on stilts in the lagoon, the Overwater Bar floats in a dreamy landscape and offers breathtaking, uninterrupted sea views. A lunchtime menu boasts salads fresh from the island’s organic garden, Mediterranean dishes and the catch of the day, while sunset is perfect for coconut martinis in the balmy evening breeze. Once a week on Wednesdays, a ‘Seafood Grill’ evening showcases produce straight from local fishermen’s nets and on Sundays, a ‘Passage through India Tandoor’ night sees sizzling meats, spicy specialties and homemade chapatis, rotis, poppadums, and delicious naans prepared using a traditional tandoori oven. Fini Foni in Dhivehi means ‘cold sweet’ and is ideally named for the homemade popsicles, ice cream and other sweet treats on offer. Mouthwatering snacks and delicious cocktails are also available upon request. 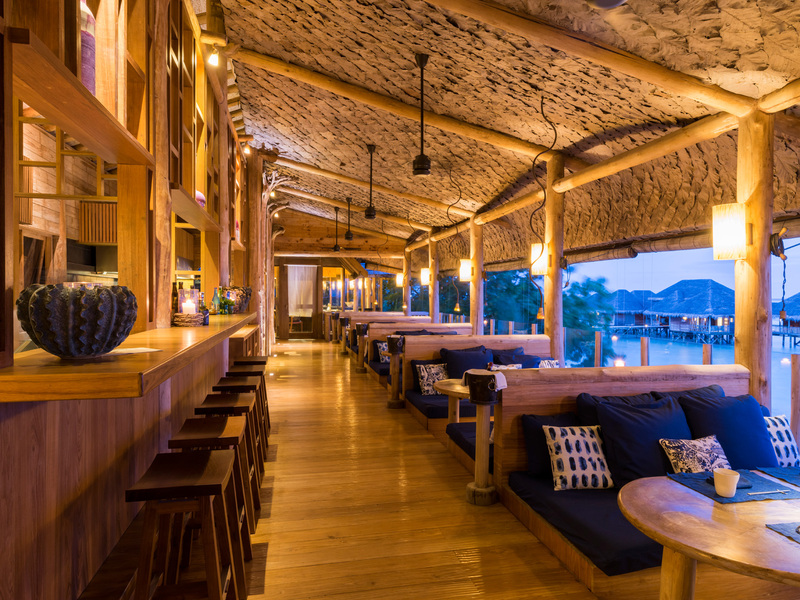 On each night of the week, guests can embark on a different Gili Wine and Dine experience at unique locations around the island from the organic garden to the underground wine cellar. Gili Lankanfushi’s Executive Chef combines locally sourced seafood and a daily harvest from the expansive Organic Garden with seasonal, specially selected produce to creative unique, European-Maldivian fusion fare, which is served in beautiful locales around the island. 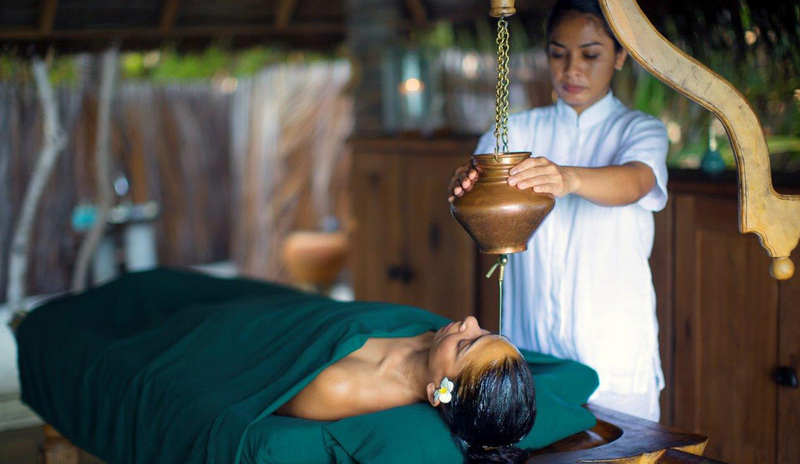 Gili Lankanfushi is home to the exclusive award-winning Meera Spa that offers traditional Ayurvedic treatments and yoga programs, a beautiful swimming pool with sun decks and loungers, and a tranquil water garden. A sanctuary of scented bliss, the spa sits in a secluded bay and is sprawled across languid waters and features six over-water treatment rooms, an Ayurvedic Treatment Champa, steam and sauna rooms and an open-air relaxation area offering breathtaking views. 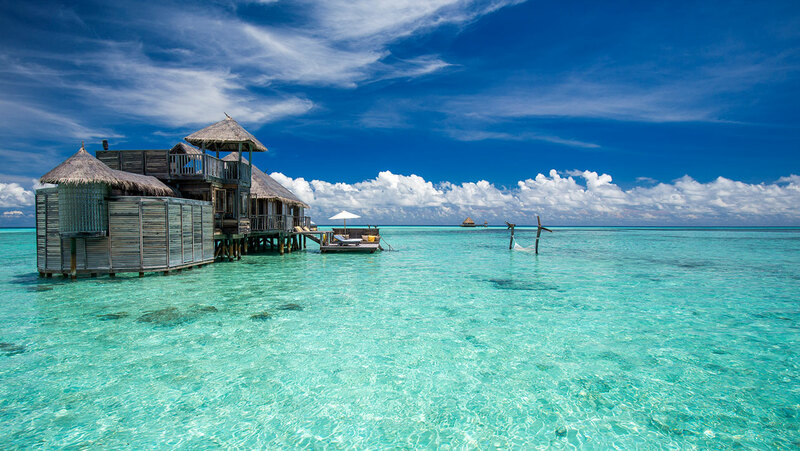 Modern facilities at Gili Lankanfushi range from a modern jungle cinema and fully stocked library to a PADI-certified Dive Center, conservation-focused Marine Biology Shack, and a fully equipped fitness center. 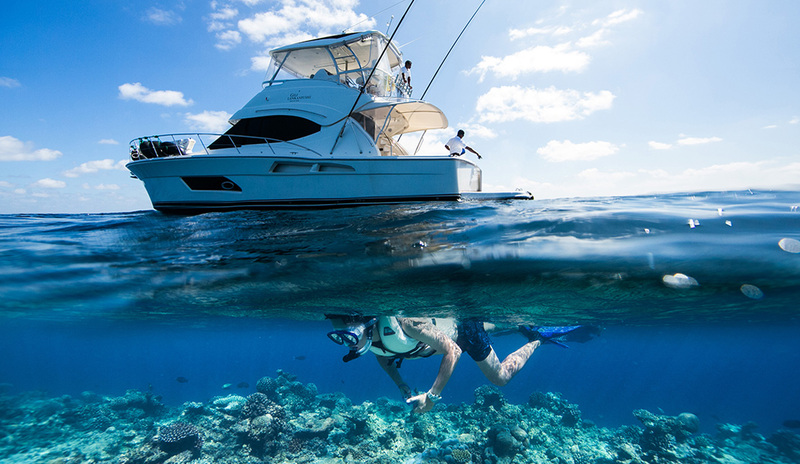 Recreational activities include snorkeling and scuba diving, surfing and swimming, water-based sports such as sailing, cruising, fishing, and water-skiing, island day trips and tours, yoga classes, and tennis. Surfing lessons are offered, as well as scuba diving courses, and guided snorkeling and diving excursions. 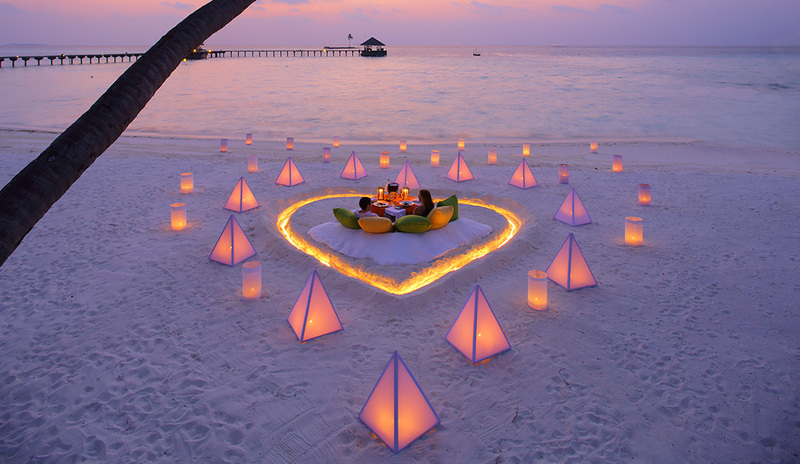 Gili Lankanfushi is a magnificent venue for romantic over-water weddings, ranging from intimate ceremonies at the stunning over-water chapel to a champagne sunset dhoni cruises and star-lit private dinners on One Palm Island. This timeless haven offers a one-of-a-kind sanctuary for a celebration of a lifetime with a variety of elegant venues, including the Lagoon Champa, One Palm Island, Over Water Bar, the Private Reserve, and Palm Beach. 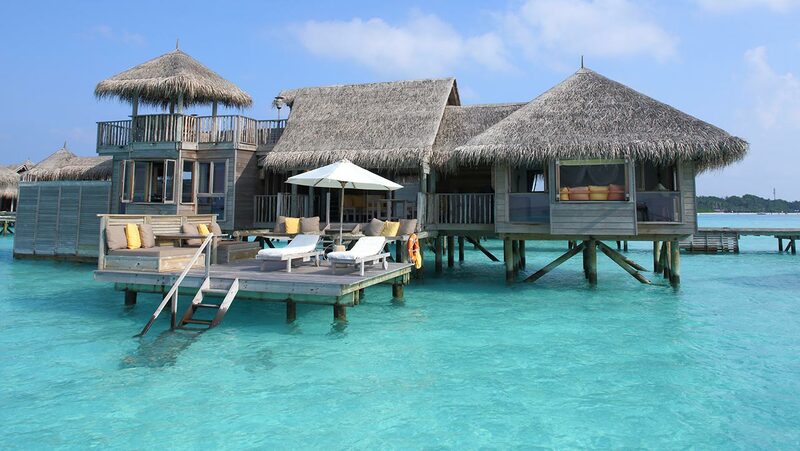 Book your incredible getaway at Gili Lankanfushi by clicking here.